Horrific. Appalling. Shocking. Abominable. Heinous. Cruel. Disgusting. All of those words come to mind when I think of modern chicken production (it’s no longer reasonable to call it “farming”). It’s bad for the animals, it’s bad for the planet, and it’s bad for us, too. “You are what you eat” comes to mind. Our supermarkets, with their sterile, plastic-wrapped packages of pre-butchered meat do an effective job of shielding us from the reality of where our food comes from. Most people have no idea just how awful the living conditions are for most of the animals that are raised for meat. Now, I’m not about to tell you to stop eating meat. But I am going to ask you to take action to help ensure that the animals you are eating are not subjected to the cruelty like what is shown in that video. I met up with Olivia from the ASPCA at a conference earlier this year, and I was thrilled to learn about their Truth About Chicken campaign. They’re working to educate people about where their meat comes from, and, better yet, empowering folks to help bring about change. Olivia recently sent me a list of some things you can do to help ensure that the lives of the chickens we eat will get better, and I’m happy to share them with you today. So read on, take action… and then enter the giveaway below! The seemingly well-meaning marketing terms on the front of packages may sound great, but they’re often unregulated and much more about marketing than actual animal welfare. 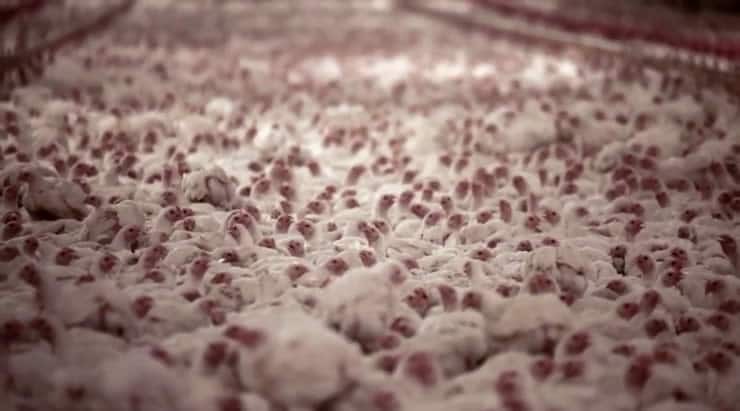 For example, “Cage Free” is a good start, but chickens and turkeys raised for meat (instead of eggs) are not typically caged, anyway — but they could still spend their entire lives in a crowded, filthy barn with no windows. Instead, look for certifications that require better treatment of animals, specifically Certified Humane Raised & Handled, Animal Welfare Approved and Global Animal Partnership “Step 3” and above. Take the ASPCA’s helpful label guide with you so you’re armed with facts. In short, you get what you pay for. Industrial meat often costs less because companies cut corners with welfare and cheap feed, and use antibiotics to speed up growth. Investing in higher-welfare products sends the message that animal suffering is unacceptable. Happy animals are healthier animals, which means that what you’re putting into your body is better for you, too. Use Local Harvest to locate a farmers market near you. There you can often talk directly to people who work on or for the farms to learn how they raise their animals. Ask them about their use of cages, pasture, and antibiotics. Ask to see photos of their farm – they should be excited and proud to show you how they care for their animals. When you buy a pastured, humanely raised chicken (or turkey, or pig…) from a farmer that really cares about the animals, you’re voting with your dollars and truly making the world a better place. Meat may be the traditional centerpiece of a meal, but that doesn’t mean there needs to be a ton of it. Why not load up on amazing veggies, too? You have the power to demand more humanely raised products in your stores. Talk to the butcher and ask where the meat comes from, and then follow through by buying only the meat that meets the higher standards of care. At Whole Foods, for example, they clearly label the standards for their meat (using the Global Animal Partnership Step-Ratings). I’ll only buy “Step 4” rated meat or above, which means the animals live on pasture their entire lives. This holiday season and going forward, demand more humanely raised chicken in your local stores with the ASPCA’s supermarket request letter. I am having an all vegetarian holiday dinner and donating to my local animal shelter. wish i wouldve turned vegan years ago! We ordered a free-range organic turkey from a local crop share this year. local and vegetarian for us …. We used to go straight to the farm to purchase our turkeys for the holidays, but they unfortunately went out of business. So, this year, I Tweeted to spread the word.